As I write this, I’m drinking a hot chocolate to warm my belly and ease the dull ache of dissatisfaction that’s buzzing in the back of my head. Today, we took a shot at Mount Marmot. Unfortunately, the steep slopes and powdery snow proved too much for the short time we had. It was already 6:00 am when the fourteen of us met at Harewood Mall. By the time we drove the long road to Nanaimo Lakes, the gates were open; since there was no attendant, we were able to drive right through. Our destination is deep in the heart of the Sadie Creek Valley, along a road familiar to me. We tried to climb this route last winter, but at that time a creek was flowing so fast that we couldn’t hop over it. Today, we discovered active logging in the area, and a new bridge constructed across that creek. With the new bridge, we were able to drive farther into the valley, making the hike several kilometres shorter. We parked on the side of the road, near a second bridge that crosses Sadie Creek. From here, we walked the deactivated road and then, due to some poor navigating on my part, bushwhacked back up to the road. Although the road is deactivated, it lacks the characteristic cross ditches; but don’t worry, it’s not missing an abundance of alder saplings. Fortunately, these were also easy to navigate. Around 550 metres, we stepped onto firm, crusty snow; it nearly took our weight, but it was too shallow. The irregular rock surface below the snow was frequently exposed, making it impracticable for snowshoes. We moved quickly along the road, and at around 700 metres we started off into the logging slash, where the snow remained sparse. As we climbed over the fallen timber and re-growing alpine fir, it began to get deeper. approaching the slopes leading to Marmot, on the old logging road. Once in the logging slash, our progress slowed. In many places, logs and stumps protruded through the relatively thin crust of snow. Reluctant to put on snowshoes in the uneven terrain, we frequently post-holed. 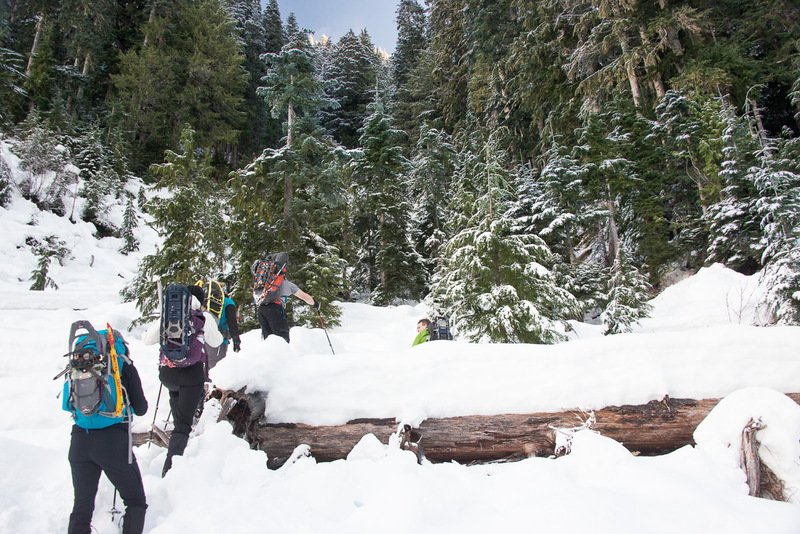 In many cases, the trailbreakers stepped into holes and found themselves waist-deep in snow! Regardless, they did a great job routing and in time we entered into the old growth (~760m). Below the high canopy of old growth, the terrain was much easier to negotiate. 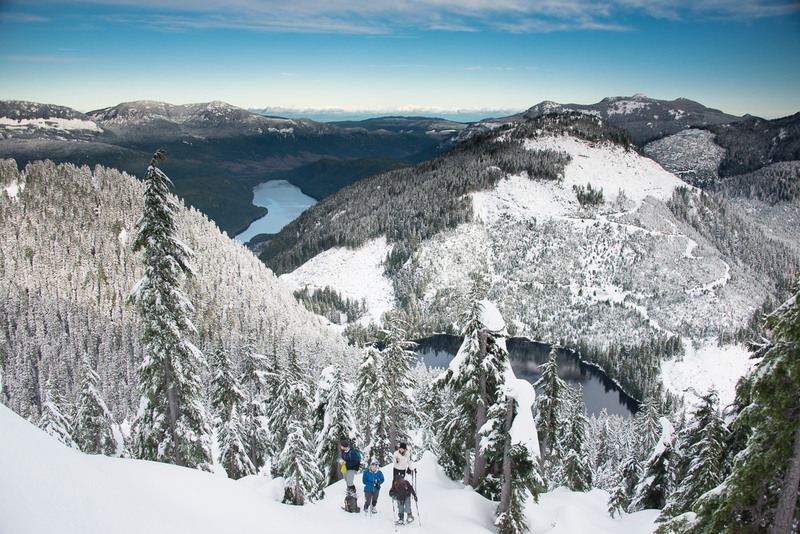 The snow was compact, probably from falling off trees, and the surface remained dense and crusty, ideal for snowshoeing. As we put on our snowshoes, we looked through the trees to the opposite side of the valley, where the hills were ablaze in the early morning alpine glow. The orange of the hills contrasted strongly with the brilliant lapis sky, while the wispy white clouds floated quickly through the air. Unfortunately, we were a bit chilly because we were still walking in the shadow of the hill. We climbed steadily, heading slightly southwest on our route to a saddle between the main summit and a sub-peak. 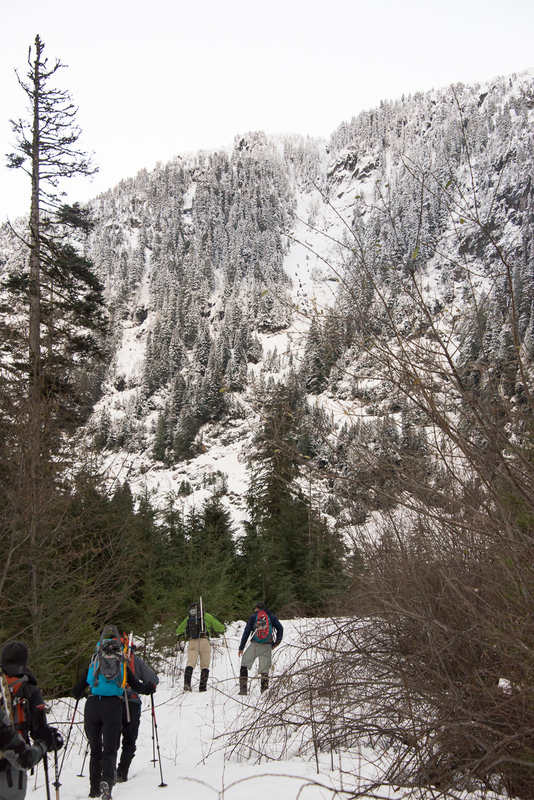 The higher we climbed, the steeper the terrain became, until it matched the steepest terrain I’ve done on snowshoes. I was worried about our group, but everyone plodded along at their own pace. A group of about ten, myself included, made it to the col (~1000 m) fifteen minutes ahead of the smaller group, who had decided to take a break lower on the hill. After a quick break, our group followed the line of the ridge toward the summit. 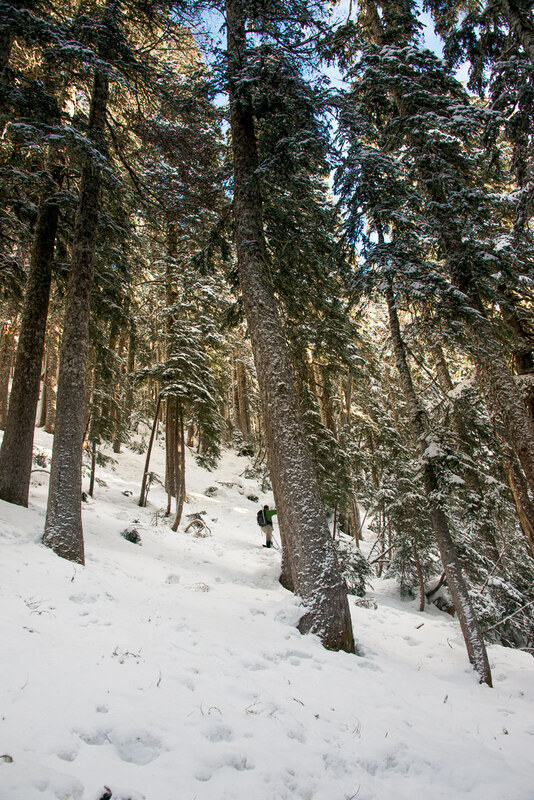 As we climbed, the route twisted through the trees and the ever-deepening snow. Above 1000 metres, the snow was powdery with no crust or ability to hold weight. Before, we had crunched happily over the snow; now, we were knee-deep, pushing our way up some steep short hills. By 12:15 pm, it was clear that we were at least another forty-five minutes from the summit. That would put us past our turnaround time. We climbed one final hill on our quest to get at least a bit of a better view after the grunt of the mountainside. On this pitch, the snow cracked and a large slab pulled away, unable to easily support our weight. Had this been a bigger slope, I’m sure an avalanche would have resulted; as it was, it only created a few moments of fun as we fought our way to the top of the hill. We paused and looked down into the Sadie Creek Valley and some of the Shaw Valley. The snowy peaks sat atop a line of green from the barren trees below. I noted how strange it looked from this perspective; normally, we view it from the bottom. In the moment, it was a surreal experience. Although we had managed to ascend without issue, the downhill journey proved more perilous; our return was quick, but not without incident. There were two separate occasions of one hiker losing footing and crashing into the person in front. In one case, the hiker slid some distance down the hill before coming to a stop. In retrospect, we should have removed our snowshoes in favour of our crampons, especially considering that in the cold temperatures of the day the ground was extremely hard-packed. Fortunately, we escaped with only a few bruises and goose eggs. Marmot Mountain continues to be on my objective list, at least for another year. The gates open next September, and this gives me plenty of time to get into better condition. I’m grateful that TimberWest opens the gates for hunters during hunting season, but hikers bemoan the closure, pounding at the gates with hiking desires in our hearts! 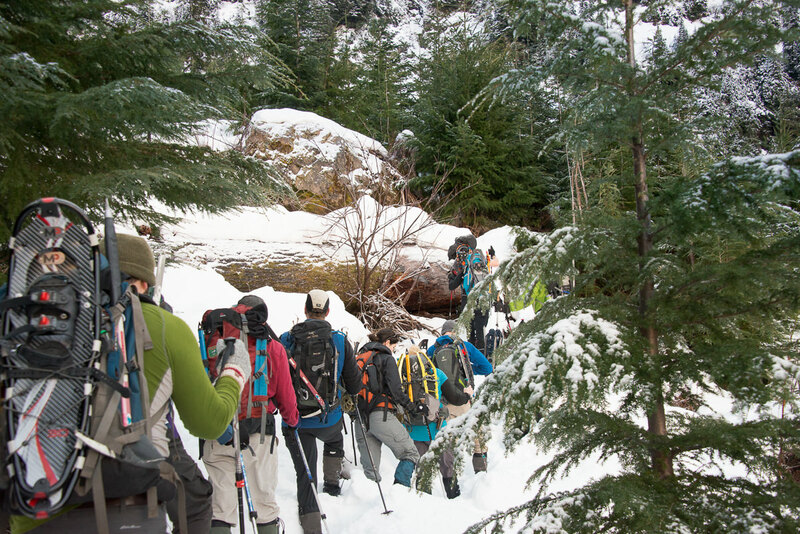 Let us in to hike your hills! Please?